As gaming has gained exposure to a wider audience and increasingly become part of the cultural mainstream, the content of games themselves has come under increased scrutiny. 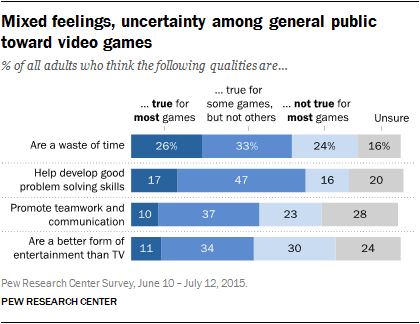 To test public attitudes toward some of these ongoing arguments, the survey presented Americans with some potential impacts of games and asked whether they consider these attributes to be true of most games, not true of most games, or whether they apply to some games but not others. “Video games are a waste of time” – About one-quarter of all adults (26%) think most video games are a waste of time, while a similar number (24%) do not think this is true of most games. One-third thinks some video games are a waste of time while others are not, and 16% are not sure. Whites (28%), those ages 65 or older (32%), and those with at least a high school diploma (27%) are more likely than others to think most video games are a waste of time. “Video games help develop good problem solving and strategic thinking skills” – Some 17% of adults think most video games promote problem solving and strategic thinking skills, but a roughly equal proportion, 16%, thinks this is not true for most games. Meanwhile, 47% say some games develop these skills while others do not, and 20% are unsure. Those under age 50 are more than twice as likely as those 50 or older to think most game develops problem solving and strategic thinking skills (22% vs. 10%), while men are slightly more likely than women to think so (19% vs. 14%). “Video games promote teamwork and communication” – Almost a quarter of all adults (23%) think most video games do not promote teamwork and communication, more than double the 10% who think most games do promote these qualities. However, a plurality (37%) thinks this is true of some games but not others, and 28% are unsure. Men and younger adults are more likely than women and older adults to believe most video games promote these qualities. Some 17% of those ages 18 to 29 think teamwork and communication are promoted by games (compared with 9% of those 30 and older), along with 12% of men (vs. 9% of women). “Video games are a better form of entertainment than watching TV” – Three-in-ten adults do not think video games are a better form of entertainment than television, almost triple the 11% who think most video games are indeed a better form of entertainment than TV. 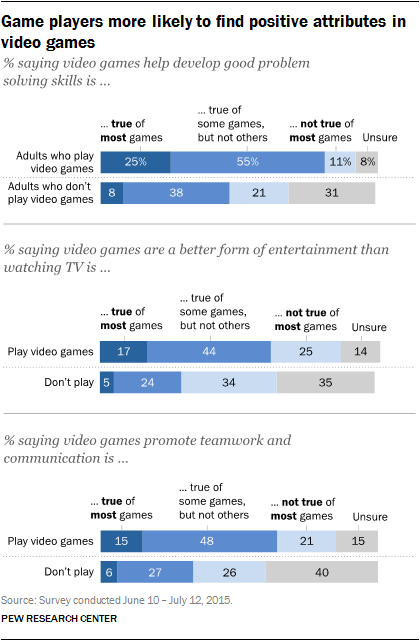 Still, a third of all adults (34%) think this is true of some video games but not others, while 24% are not sure. Almost a quarter of those ages 18 to 29 say most video games are a better form of entertainment than TV (24% vs. 7% of those 30 and older), as do 14% of men vs. 8% of women. “Video games portray minority groups poorly” – Fully 47% of adults say they are not sure whether video games portray minority groups poorly. Almost a quarter of all adults (23%) think most video games do not portray minority groups poorly, more than double the 9% of adults who think minority groups are portrayed poorly in most games. Some 20% think minority groups are portrayed poorly in some games but not others. Interestingly, just 13% of blacks and 11% of Hispanics think most video games portray minority groups poorly, compared with 7% of whites. Young adults are slightly more likely than their older counterparts to think most games portray minorities poorly – 13% of those 18 to 29 say so, compared with 7% of those 50 or older. “Video games portray women poorly” – Similarly, 40% of Americans say they are not sure whether video games portray women poorly. Another 18% say this is not true for most games, while 14% say this is true for most games. More than a quarter of all adults (27%) say this is true for some video games but not others. Notably, the responses to this question show no differences by gender. Young adults are split on the portrayal of women – 24% each of those 18 to 29 think most video games do and do not portray women poorly. While the public is largely uncertain what to think about video games, within the gaming community there is more consensus. Put simply, people who play video games are more likely to respond to the positive aspects of their pastime while they disagree with certain negative portrayals. And certain groups of game players – namely men and young adults – hold particularly strong and affirming beliefs about gaming. 25% of those who play games (and 39% of self-identified gamers) think most video games help develop good problem solving and strategic thinking skills, compared with just 8% of those who do not play games. Among game players, men are more likely than women to think most games develop problem solving and strategic thinking skills (28% vs. 22%). Likewise, 31% of game-players ages 18 to 29 think this is true of most games, compared with 18% of those 50 and older. 17% of those who play games (and 34% of self-described gamers) say most video games are a better form of entertainment than watching TV. This is triple the proportion of non-game players (5%) who say the same. Among those who play video games, men are more likely than women to say most games are better entertainment than TV (23% vs. 10%), along with 31% of game players ages 18 to 29. 15% of those who play video games (and 28% of self-described gamers) think most video games promote teamwork and communication. This compares with just 6% of those who do not play video games. Again, men and those ages 18 to 29 who play video games are more likely than their counterparts to think most games promote teamwork and communication. Some 19% of male game players think so (compared with 12% of female game players), as do 21% of game players ages 18 to 29 (compared with 11% of those 50 and older). 35% of those who play games (and 53% of self-described gamers) do not think most video games are a waste of time. Men who play games are particularly likely to feel this way – 40% say games are not a waste of time, compared with 30% of female game players. Younger game players also tend to feel relatively strongly about this issue — fully 43% of game players ages 18 to 29 say most games are not a waste of time, compared with 31% of those 30 and older. 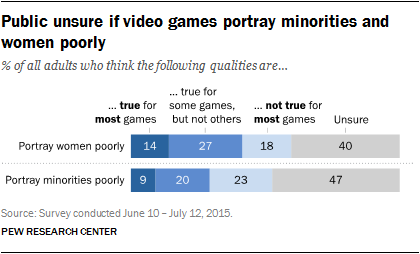 33% of game players (and 46% of self-described gamers) do not think most video games portray minority groups poorly. Minority game players are more likely to agree with this statement than whites. Some 15% of black and 12% of Hispanic game players feel that most video games portray minority groups poorly, compared with 7% of white players. At the same time, 39% of Hispanics and 24% of blacks who play games feel that most games do not portray minorities poorly. And once again, men are particularly likely to disagree with negative views of games: 36% of men who play say most games do not portray minorities poorly, compared with 30% of women. One-quarter (26%) of video game players (and 35% of self-described gamers) disagree that most video games portray women poorly. Still, 16% of game players (and 24% of gamers) think most video games do portray women in a negative light. Some 34% of those who play video games (and 30% of self-identified gamers) say this is true of some games but not others. Interestingly, there are few gender differences among those who play video games – women who play games are somewhat more likely to be unsure than men (27% vs. 21%). Despite their relatively positive views toward video games compared with non-game players, a substantial portion of game players have mixed feelings on many of these issues. For instance, 55% of video game players think some games develop good problem solving and strategic thinking skills, while other games do not. Similarly, 37% of game players feel that some video games are a waste of time, even while others are not. Finally, even people who play games are not always sure what to think – for example, 31% of game players say they are unsure whether or not most games portray minority groups poorly.